Roxanne Swentzell, resident of the Santa Clara Pueblo, is the daughter of Rina Swentzell. From a family of renowned potters and sculptors, her talent was recognized early, and she was given the opportunity to spend two years at the Institute of American Indian Arts in Santa Fe before graduating from high school where her pieces first began to grow in size. From there she attended the Portland Museum Art School for a year. Swentzell was 22 when she first displayed her works at the annual Indian Market in Santa Fe. There, in 1986, she won a total of eight awards for her unique sculpture and pottery, and in 1994, she also won the Market’s Creative Excellence in Sculpture award. Among her most popular works is the Emergence of the Clowns, which toured the US, Canada and New Zealand as a part of the Heard Museum’s exhibition, Shared Visions, and showed at the White House in the exhibition Twentieth Century American Sculpture at the White House. 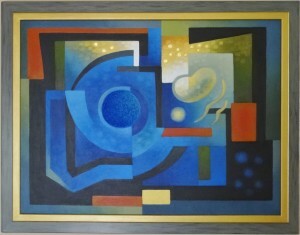 This piece can be seen in the Heard Museum’s Permanent Collection. Her work has been exhibited at American Craft Museum, New York, NY, Heard Museum, Smithsonian National Museum of the American Indian, New York, NY, Carnegie Museum of Art, Pittsburgh, PA, National Museum of Women in the Arts, Washington, D.C., The White House, Washington, D.C. She has been collected in many private and public collections. Roxanne is the granddaughter of Rose Naranjo, niece of Dr. Tessie Naranjo, Professor Tito Naranjo, potter Jody Folwell, sculptors Michael Naranjo and Nora Naranjo-Morse and potters Dolly Naranjo and Edna Romero. She is the cousin of potters Jody Naranjo, Susan Folwell, Polly Rose Folwell, Dusty Naranjo and Forrest Naranjo.